January started off with a bang for the markets with the S&P 500 gaining 5.6% for the month. Although that's down from the high point when it was up 7.5% earlier in the month. Of course the dip at the end of January was apparently just the beginning of a crazy start to February. During January my net worth increased $19,325.38. 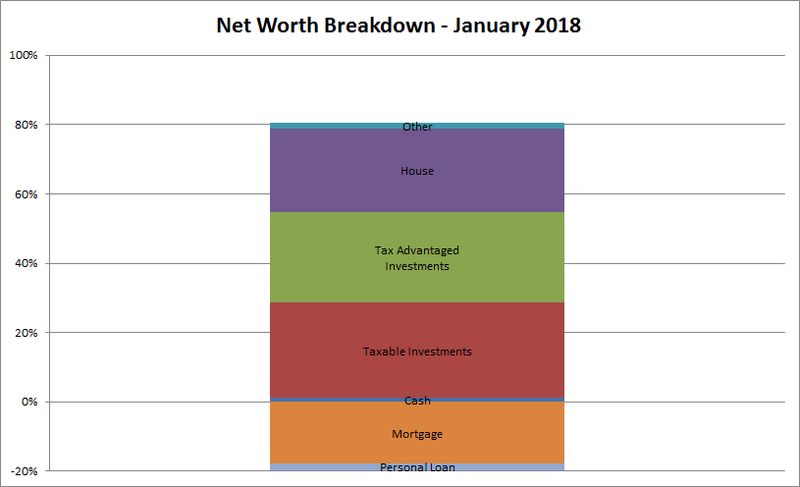 My net worth increased a whopping 3.6% during January. Even crazier is since January 2017 my net worth has climbed over $84k or 17.9% which is especially impressive since we weren't investing new capital in that time. We were still transitioning back to me working again so investing wasn't the main focus. It's fun to ride the wave of a bull market higher, but that will only last so long. The more important thing is seeing that we're back to being cash flow positive by a few grand each month. During January I set some financial targets for my wife and I to get our debt paid down which is priority #1. There's honestly no reason to keep that debt hanging around even though it is at low/no interest. As of the end of January we have 25.8% equity in our house based on our purchase price from 2013. However, according to Zillow our house has increased in value just over $35k from our purchase price which is a nice bonus, although I keep the purchase price as the value in the net worth equations. Based on Zillow's estimate the equity in our house is 36.1% thanks to the appreciation. Since I write so much about investigating companies as an investment I figured it'd be fun to see how our balance sheet looks. As of the end of January our debt to equity ratio is 32% and our debt to total capitalization is 20%. Not bad, but I'd love to get that debt down to ZERO! Truly passive income, dividends and interest, totaled $279.01 during January which was about a $21 increase from October 2017. *Dividends are from my taxable accounts only. With my writing taking a back seat the past few months the EBIT from blogging/writing has been fairly negligible the past few months. As such, January saw a big, fat ZERO of EBIT. Thus far in 2018 I've totaled $279.01 worth of income outside of a traditional day job. 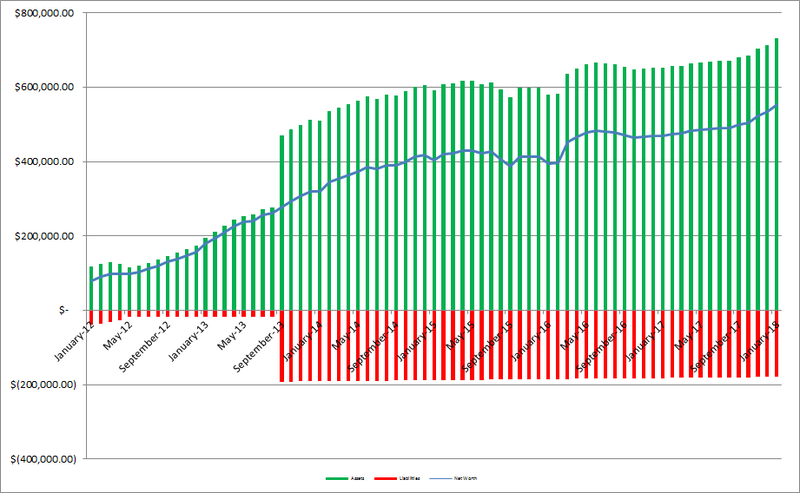 I much prefer the cash flow, but the balance sheet also gives another view of the overall financial landscape. I'm happy with the run my net worth has had and judging by the last few days February could just turn into a positive month as well. Congrats on the increase in net worth in January. 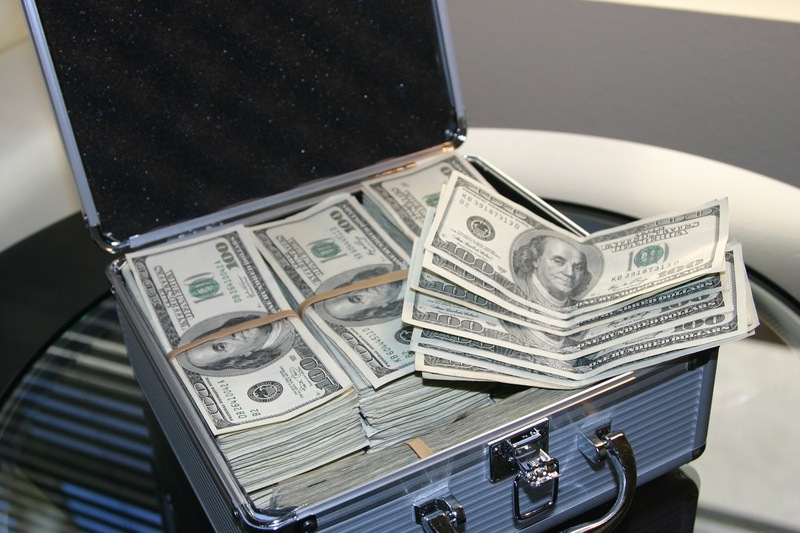 I've been considering for a while whether I should blog about my net worth, but haven't yet decided. I'm with you in wanting to get rid of debt, even though the interest is low, but at the same time, not seeing a need to pay off the mortgage early at this time. I'm actually in a similar boat. I have a student loan debt with a 2.625% interest rate that I'm trying to pay off. But, I'm trying to let my tenant pay off my mortgage (3.5%) while I focus on other investments. Eventually, if I own additional properties, (which I'm trying to do), I'll employ a strategy where I begin to aggressively pay off my mortgage early. I look forward to following your progress. I think this might be my first time here (or at least first time in a long time - can't remember). Our NW has definitely been riding the boom these past several years. It's getting a little choppy these days, but I'm not too worried since we're invested for the long run. We're also diversified with our real estate assets as well. 2018 will be an interesting year to come!